I had pie for breakfast. We played in the rain with our tiny tot. The Hubs and I had boozy coffee this afternoon. We did NOT go to a mall. Though totally soggy outside, it was a great day! Thanksgiving is my all-time fave holiday and luckily my work loves to celebrate! I made this Cranberry Apple Upside Down Cake for our Pre-Thanksgiving Warm Up Potluck. I'd been thinking about making something like this for a while - I adapted this cake recipe and experimented with the rest. It was really tasty and really pretty! Good combo for a potluck! Prep a 9 inch cake pan by buttering and flouring bottom and sides. Cut a piece of parchment to fit the bottom, and butter that. Toss chopped apples and cranberries with brown sugar and cinnamon. Set aside while batter is made. 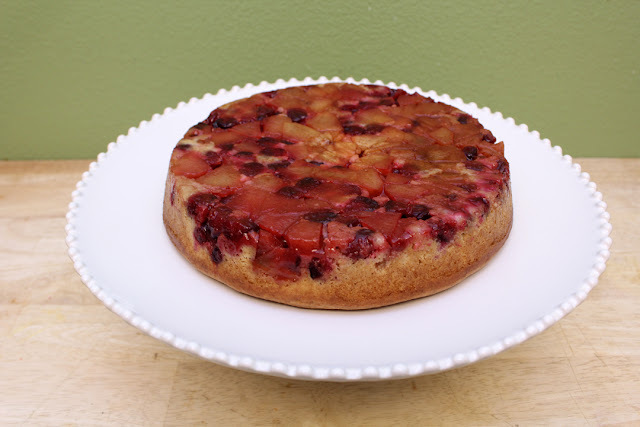 Pour apples and cranberry mixture over parchment in the bottom of the cake pan. Arrange the fruit so it's evenly distributed. Pour cake batter over the fruit and smooth out - it's OK if the batter is not totally to the edges and a bit uneven... this will be the bottom of the cake anyway. How nice is that?! Bake 35-40 minutes and check for doneness with a wooden skewer. The skewer should come out clean, with a few moist crumbs stuck to it. Let the cake cool on a wire rack until it's room temp. Invert over a cake stand and peel off the parchment. The fruit will be soft and beautiful! 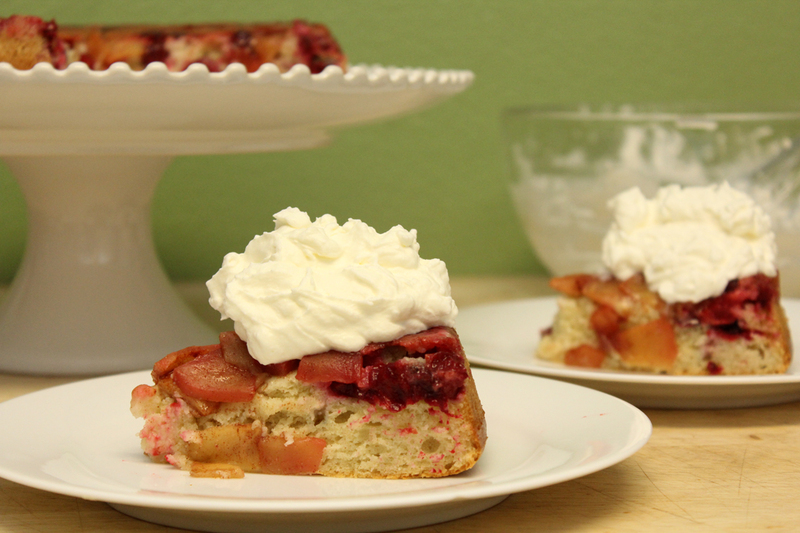 I dolloped a bit of whipped cream on top, because that's always a good idea. I think this would be great with other kinds of hearty fruits - cherries would be amazing! Plums, apricots, or nectarines sound good too. Also, I might add a bit of orange zest to the cake the next time I make this. Just to make things even more special.